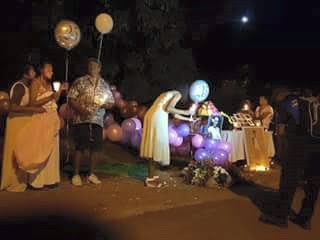 This is the 11th day since the tragic death of former Miss PNG late Ruby-Ann Laufa and the police were at the accident scene conducting investigations and interviewing possible witnesses. The team from the NCD Traffic division were seen interviewing Mr Maurice Laufa and her daughters after checking out the accident scene. According to the OIC for Traffics, Inspector Philip Koliadi, they will be speaking to the UPNG Security guards who were on duty at the time of the incident and other staff members of the university who probably witnessed something.